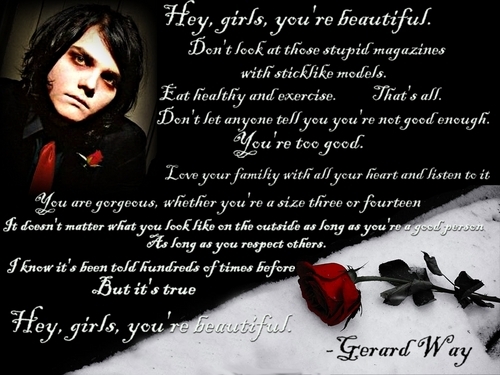 My name is Gerard. I know, it's weird how I have Gerard Way's name. Maybe that's why I fell in love with him. Yup, I love MCR. Anyone else? Bite me. I seem to be the only real fan. I don't like them BECAUSE of their hotness. I enjoy the music and the meaning behind it. I like tons of stuff too. Razors and gore are my life. I'm into black and blue. MCR colors! Nothing much to know about me, I'm just a small town girl with a big dreams. You can hate me you can like me I don't really care cause if you don't like me then why are you even here reading thing, or even on my page so no one really cares nor do I. I hope you guys like my photos if you add me I will more then likely add you back... McR ROX!! But, if there is anything more you wish to know then just click the like under "web" and yea you can add me if you want. Favorite Bands: Oasis, Smashing Pumpkins, Blur, The Misfits. I forget the other band members. Doesn't mean I'm NOT the biggest fan. I AGREE WITH ALL THERE QUOTES!!! Login or register to add mcr=mylyfe as your friend!